COMPANY PROFILE Karnataka Bank Ltd is an Indian banking company. It is engaged in providing retail banking, corporate banking, personal banking as well as lending services, credit facilities, insurance services and banking operations to individuals, corporates and other. Karnataka Bank Ltd is an Indian banking company. It is engaged in providing a wide range of banking and financial services including retail, corporate banking, and para-banking activities. The company provides deposit schemes such as saving accounts, certificate of deposits, cash management account, and money market accounts. It also provides working capital finance, term loans, and infrastructure finance to small and medium businesses, corporates and entrepreneurs. In addition, it also provides money transfer facilities, insurance services, and others. The company has four reportable segments namely Treasury, Corporate/Wholesale Banking, Retail Banking and Other Banking Operations. The main source of company’s revenue is interest income, fees, commission, premiums, and other income. 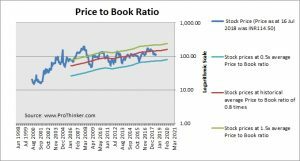 At the price of INR114.50 as at 16 Jul 2018, Karnataka Bank Ltd is trading at a Price to Book Ratio of 0.6 times current book value. 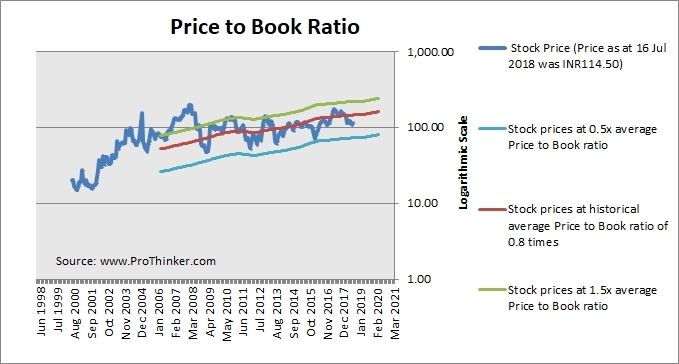 This is a 21% discount to its historical average Price to Book Ratio of 0.8 times.